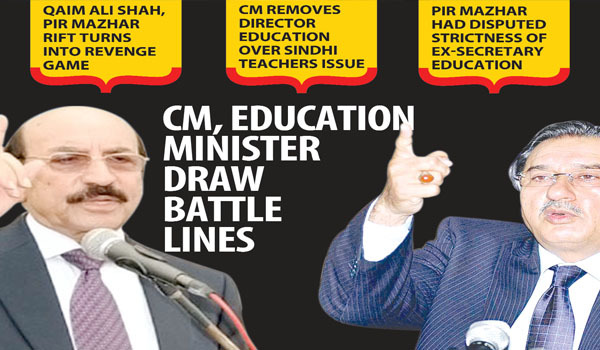 As the ongoing rift between Sindh Chief Minister Qaim Ali Shah and Senior Minister Pir Mazharul Haq reached its highest peak, the chief executive of the province has started removing Pir-backed education director to further delay the recruitment of more than 1,300 Sindhi language teachers (SLT) in the metropolis. Interestingly, the most influential Secretary Services Iqbal Durrani, who is also son-in-law of the chief minister, is playing within the rift to take revenge from the provincial education minister for sidelining secretary’s wife Nahid Durrani, daughter of the Sindh CM, Pakistan Today has learnt. The PPP-led Sindh had announced to recruit more than 1,300 SLTs in BPS-9, 14 and 15 with a condition that the candidate must have studied Sindhi as compulsory subject throughout his/her education from institutions of the metropolis. Besides, another major condition was that he must have a domicile of Karachi. The written test for the candidates was held at Safia Khanum Memorial School near Gurumandir for females, and the test for boys was held at Government Boys and Girls School Moosmiyat in March 2012. The interviews were conducted in April 2012, however, the process was halted completely over the differences of appointment procedure between the CM and the education minister. Sources told Pakistan Today that the merit list of the successful candidates was to be put on display in the first week of May 2012, however, the process was delayed over the differences of the mode of recruitments. The candidates who have appeared in the written test and interviews could be seen wandering in Sindh’s education department asking date for issuance of merit list and the display of merit list. However, the candidates return without getting proper reply from the authorities concerned as they tell the candidates that orders would be issued by the CM himself. A high official close to the chief minister told Pakistan Today that Pir Mazhar was trying to influence chief minister over the appointment of teachers, however, the CM was insisting on merit-based recruitment in the city. After the rift between two politicians, Pir Mazhar left for London citing health issue of her wife. Qaim also complained to President Asif Zardari over the rude attitude of Pir Mazhar and the president has reportedly given go-ahead to the chief minister on recruitment of SLTs on merit basis, the sources added. Interestingly, Pir Mazhar had also developed a serious dispute with the CM over strictness of former secretary education, Nahid S Durrani, who is daughter of chief executive, as Pir Mazhar could not use his alleged malpractices in the presence of CM’s daughter. Naheed Durrani’s efforts to curb corruption and other irregularities in the Sindh education department cost her the post of secretary, with Pir Mazharul Haq choosing to side with elements involved in receiving heavy commissions and kickbacks. Initially, Nahid had been sent on leave, but in fact the move is just a precursor to her permanent transfer from the education department. At that time, Pir Mazhar approached Faryal Talpur, President Asif Ali Zardari’s sister, with a request to grant permission to remove Naheed Durrani from the secretary’s post. After her removal, proceedings initiated by Durrani against embezzlement and other irregularities in the department would immediately be stopped, and things will settle to the same position that existed before she assumed charge, the sources claimed. Durrani had sent at least three different cases of corruption and irregularities to the National Accountability Bureau (NAB) and National Accountability Courts for proceedings in April alone. Each of these cases dealt with embezzlement of millions – all in the name of education. The first reference sent to the NAB court was filed under section 18 of the National Accountability Ordinance (NAO)-1999, with Durrani pleading the court to take notice of embezzlement in procurement of some 42 vehicles, for which the Sindh government had paid Rs 94.966 million to M/S World Automobiles, Karachi. The orders for the vehicles were placed in connection with a project backed by the Canadian International Development Agency (CIDA) named ‘Revitalization Existing Teacher Training Institutions of Sindh’. The project was aimed at providing basic needs to all teacher training institutions of Sindh, and a memorandum of understanding (MoU) was signed in 2006 between the Pakistan government and the CIDA. The project was federally funded at a cost of Rs 1,261.733 million, with a completion period of five years from February 23, 2007. The project sought to improve the quality of primary and middle-school education, and was to provide vehicles, mobile in-service teaching units, resource kits and scholarships. As many as 42 vehicles had to be provided to 42 institutions for mobile in-service teaching units, at an estimated cost of Rs 149.949 million. An agreement was inked between the then project director of the education department and M/S World Automobiles Karachi. After approving quotations provided, the department paid world automobiles in full, but despite the passage of more than four years, the company only delivered 16 vehicles. The sources said that “high-ups” in the education department received heavy amount from the company, and as a result, ignored the matter for four years. When Durrani assumed charge as the secretary, she inquired about the matter, and after getting an improper reply from the company, she sent a reference to the NAB court for the recovery of remaining Rs 62 million. In the reference, she had prayed to the NAB court that the respondents should be directed to provide the remaining 27 vehicles booked on advance payment as well as pay a penalty at prescribed percentage of undelivered vehicles, or return Rs 62 million and pay interest at the market rate from 2007 to the date a decision is handed out. She also prayed to the court to initiate criminal proceedings after comparison of documents submitted by the defendants. In another reference, Durrani on behalf of the education department prayed the NAB court to direct the owners of World Automobiles Karachi to deliver Hinopak buses that the department placed orders for in 2007, or return Rs 37 million as well as a fine. The third case was of auditing the accounts of the Sindh Textbook Board: Durrani had written a letter to NAB authorities to screen the audit. Subsequently, NAB had initiated an inquiry last week. Durrani had also taken strict action against the illegal use of more than 20 vehicles of the education department by the personal staff of the minister. She had also taken notice of fake appointments in the department. The Anti-Corruption Department after completing its inquiry had sent a case to the courts for further proceedings. A deputy secretary and former section officer of the department are behind bars in this case. Furthermore, to settle down the rift between the two senior leaders of the ruling PPP, MNA Faryal Talpur played a positive role and it was decided that initially Pir Mazhar would issue SLT orders, however, Karachi Director Education Ghulam Hussain Dal was removed from his post within a period of two days. After the removal, Pir Mazhar got angry and complained to President Asif Zardari against the chief minister’s move and the minister was assured that the director education would be reposted, however, the secretary services was not complying with the orders of senior leadership just to take revenge of her wife’s sidelining by the education minister.